Laboratoire de Biotechnologie des Molécules Bioactives et de la Physiopathologie Cellulaire. Université de Batna-2, 05000, ALGÉRIE. Objectives: To evaluate the in vivo anti-ulcer and anti-inflammatory activities of methanol extract of the aerial parts of Gladiolus segetum. Methods: First methanol extract of Gladiolus segetum was subjected to the acute oral toxicity test according to the OECD, guideline no 423.The anti-ulcer activity of Gladiolus segetum was investigated by ethanol induced gastric ulcer in Wistar rats. Methanol extract was administered by gavage one hour before ethanol to the different groups at a dose corresponding of 100,250 and 500 mg/kg body weight. The control group received normal saline in comparable volume (10ml/kg body weight) by the same route. The anti-inflammatory activity of the tested extract was evaluated in adult wistar rats by the egg albumin induced paw edema method. 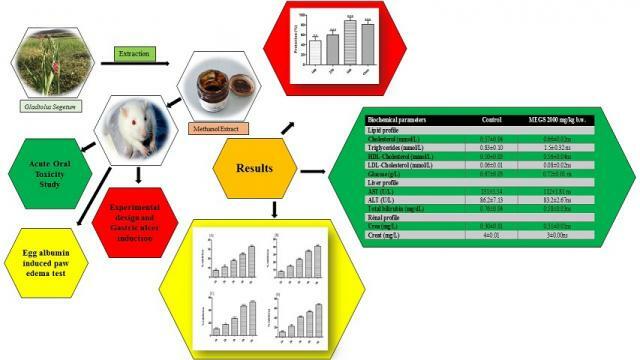 Results: A significant reduction (p <0.001) was observed in the results of the present study, revealed that methanol extract possessed gastroprotective activity and exerts a topical anti-inflammatory effect in vivo. Conclusion: These results suggest that methanol extract of Gladiolus segetum may represent an important clinical alternative in anti-inflammatory and antiulcer genic therapeutics. Marref SE, Benkiki N, Melakhessou MA, Bouzidi S. Acute Toxicity, Anti-ulcer and Anti-inflammatory Effects of Methanol Extract of Gladiolus segetum in Rats. Pharmacognosy Journal. 2018;10(4):758-762.